What Information Should You Include When Acknowledging a Donation? New tax law, beginning in 2018, makes it much more difficult for people to deduct charitable donations to their favorite charities. The goal posts have moved since the law increases the standard deduction ensuring that fewer Americans will be itemizing their deductions. But has the Tax Cuts and Jobs Act changed the way charities acknowledge donations or the way donors prove that they made a charitable contribution? No. The new tax act makes it even more apparent that donors must continue to substantiate donations through contemporaneous written acknowledgments. Therefore, charitable organizations (501c3) should continue the practice of providing written acknowledgment of donations of $250 or more. Donors who plan to deduct charitable contributions need to retain these letters in their tax records. There are two steps to thanking a donor. The first has to do with establishing a good relationship with each donor, and the other action has a very legal purpose. 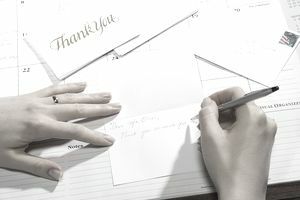 First, you need a warm thank you letter, but you also must include legally required information so that donors can document that they gave a tax-deductible donation to your charity. The IRS requires public charities (also known as 501(c)(3) organizations) to send a formal acknowledgment letter for any donation of more than $250. The donor may use this letter as proof of his or her contribution and claim a tax deduction. Most charities send an acknowledgment for all donations, even small ones. Both goals, thanking the donor and satisfying the legal requirements, can be accomplished at the same time or separately. Most charities manage to achieve both conditions within one letter. Acknowledgment of donation must occur no later than January 31st of the year following the gift. However, best practice suggests that charities should send an acknowledgment as soon as possible after the gift is received. Also, most charities send a summary of a donor’s contributions for the previous year by the end of January. In an age of multi-channel fundraising appeals and donations, sending that end-of-year summary by mail (no matter whether the original donation/s came by physical check or online), assures that your organization has adequately notified the donor. Can you send that final summary of a donor's contributions for the prior year by email? Yes. There is no legal prescription for the form any acknowledgment letter must take. For instance, it could be a postcard, an email, or a physical letter. However, in my opinion, it's best to make that year-end summary a physical letter by mail. An email message might not be noticed in a crowded mailbox or even end up in the donor's spam folder. A description (but not value) of a non-cash gift. The donor estimates the value of non-cash contributions when reporting them to the IRS on his tax return. A description and good faith estimate of the value of goods or services, if any, that the organization provided in return for the contribution. An example could be a dinner where some of the money pays for the meal while the rest is a donation. A statement that goods or services, if any, that the organization provided in return for the contribution consisted entirely of intangible benefits if applicable. An example might be a small gift valued less than $75, such as a mug or tote bag with the organization’s logo. What Will Happen If My Organization Doesn’t Provide a Proper Acknowledgment? The IRS has denied tax deductions to donors who cannot offer proper acknowledgment for their donations to a charity. The “Chronicle of Philanthropy” reported on this in its article, IRS Crackdown Puts Focus on Gift Records. In one case, the judgment hinged on the acknowledgment not being timely enough and lacking the required language. TIP: Develop your acknowledgment language and have it assessed by an attorney who specializes in nonprofit matters. Then use the same language consistently. There is no reason your organization cannot provide a warm thank you that will encourage your donors to give to you again and fulfill your obligation to provide an IRS acceptable acknowledgment of the donation. Although acknowledgment language should be suited to each charity, here are two examples of statements that meet all the requirements. The first came at the end of a written letter sent by mail; the second was part of an email thank you. 1. "As a 501c3 charity, tax laws require us to notify you that this letter is the official acknowledgment of your gift. Also, we are required to certify that you received no goods or services in consideration of this contribution; therefore, the full amount of your gift is tax-deductible. Thank you!" 2. "Partners In Health, a 501 (c)(3) not for profit organization, has not provided any goods or services, in whole or in part, to you in consideration for this voluntary cash contribution. If you wish to claim the tax deductibility of this gift in the U.S., please retain this acknowledgment letter for your files. Partners In Health's EIN number is xxxxx."